At present, health spending is only 1.15-1.5% of GDP. In the Interim Budget 2019-20, 10.6% of the total amount is allocated to defence, while only 2.2% is allocated to healthcare. India’s per capita expenditure on health remains among the lowest in the world. The presented Interim Budget is responsive to the needs of farmers and the middle class, it does not adequately respond to the needs of the health sector. The total allocation to healthcare is Rs. 61,398 crores. While this is an increase of Rs. 7,000 crores from the previous Budget, there is no net increase since the total amount is 2.2% of the Budget, the same as the previous Budget. Per capita spending on health in the Budget in India is Rs.458 (Rs.61,398 crore/ 134 crore, which is the population). The U.S. spends $10,224 per capita on healthcare per year (2017 data). A comparison between two large democracies is telling the U.S.’s health expenditure is 18% of GDP, while India’s is still under 1.5%. US Budget spending per capita on health in the U.S. is therefore $3,150 ($1.04 trillion/ 330 million, the population). Adjusting for purchasing power parity, this is about $30, one-hundredth of the U.S. Yet, the $4,000-$5,000 per capita spending in other OECD countries is not comparable with India’s dismal per capita health expenditure. The rate of growth in U.S. expenditure has slowed in the last decade, in line with other comparable nations. According to the National Health Profile of 2018, public per capita expenditure on health increased from ₹621 in 2009-10 to ₹1,112 in 2015-16. These are the latest official numbers available, although in 2018 the amount may have risen to about ₹1,500. With the government sparing just 1.3 per cent of the GDP for public healthcare for many years, way less than the global average of 6 per cent, there remains a severe scarcity of doctors in the country and people continue to incur heavy medical expenditure across rural and urban hospitals. These are among the grim facts recorded in the National Health Profile 2018, an annual report released recently by the Central Bureau of Health Intelligence (CBHI). The NHP report reflects the consistent indifferent approach of the government in terms of public health spending. The infant mortality rate at the national level stands at its lowest i.e. 34 per 1,000 live births, however, the gap between rural (38) and urban (23) mortality rate is still high. With rabies having a 100 per cent fatality rate amongst 97 cases reported in the year, it remained one of the most lethal communicable diseases in the country for the year. According to the report, the cases of Influenza A H1N1 (Swine flu) witnessed a 21-time increase, as 38,811 number of cases were reported leading to a casualty of 2,266 in comparison with 1,786 that were reported in 2016. Through the world’s largest healthcare programme, Ayushman Bharat, to provide medical treatment to nearly 50 crore people in the country, around 10 lakh patients have already benefited through free treatment for medical treatment which would have otherwise cost them Rs. 3,000 crore. 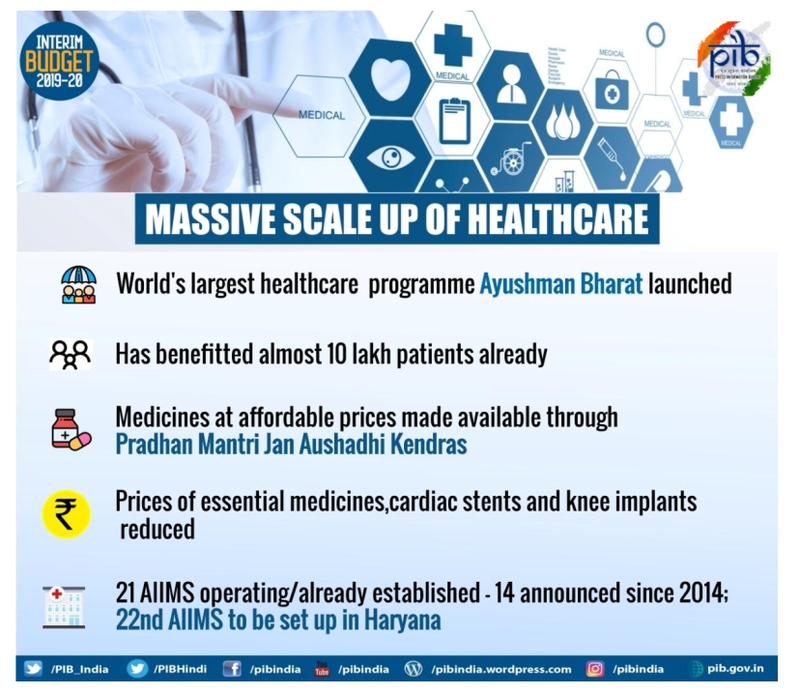 Lakhs of poor and middle-class people are also benefiting from reduction in the prices of essential medicines, cardiac stents and knee implants, and availability of medicines at affordable prices through Pradhan Mantri Jan Aushadhi Kendras. It was announced that nearly 1.5 lakh health and wellness centres would be set up under Ayushman Bharat. The mandate of these centres is preventive health, screening, and community-based management of basic health problems. The mandate should include health education and holistic wellness integrating modern medicine with traditional Indian medicine. Both communicable disease containment as well as non-communicable disease programmes should be included. Finance Minister announced setting up of a new – the 22nd AIIMS in Haryana. Increase of GDP alone does not guarantee health, since there is no direct correlation between GDP and health outcomes. However, improvement in health does relate positively to GDP, since a healthy workforce contributes to productivity. For various diseases, allocation should be realigned for disease management over a defined time period, not merely for episodes of care. Cancer screening and prevention are not covered. There is no resource allocation for preventive oncology, diabetes and hypertension. Prevention of chronic kidney disease, which affects 15-17% of the population, is not appropriately addressed. The standard health insurance policies cover cancer but only part of the treatment cost. As a consequence, either out-of-pocket expenditure goes up or patients drop out of treatment. The 1,354 packages for various procedures in PMJAY must be linked to quality. The Central and State governments have introduced several innovations in the healthcare sector in recent times, in line with India’s relentless pursuit of reforms. However, while the government’s goal is to increase public health spending to 2.5% of GDP, health spending is only 1.15-1.5% of GDP. Since a major innovation in universal healthcare, Ayushman Bharat, is being rolled out, it must be matched with a quantum leap in funding. Only if we invest more for the long-term health of the nation will there be a similar rise in GDP.